Asia Tenggara atawa Asia Kidul Wétan nyaéta hiji subwewengkon di Asia, nu ngawengku nagara-nagara nu sacara géografis aya di kiduleun China, wetaneun India sarta kalereun Australia. Wewengkon Asia Tenggara ngampar dina interseksi pelat géologis, kalayan aktivitas seismik katut vulkanik nu rongkah. Asia Tenggara ngawengku dua wewengkon géografis: Asia daratan, jeung island arc katut kapuloan nu aya di wetan jeung wetan kiduleunnana. Bagéan daratan kaasup Kamboja, Laos, Myanmar, Thailand jeung Vietnam; nu populasina utamana urang Tai jeung urang Austroasiatik; ageman nu dominan nyaéta Buda, tuluy Islam. Bagéan maritim kaasup Brunei, Timor Wetan, Indonesia, Malaysia, Pilipina jeung Singapura. Urang Austronesia nu panglobana aya di wewengkon ieu; ageman nu dominan nyaéta Islam,tuluy Kristen[rujukan?]. Asia Tenggara mindeng nujul kana hiji wewengkon nu ngawengku nagara-nagara di handap ieu, sok sanajan ari dina prak-prakannana mah, boh sacara umum atawa husus, wewengkonna bisa leuwih heureut atawa leuwih lega. Sakabéh nagara nu disebutkeun di luhur nyaéta anggota Association of Southeast Asian Nations (ASéaN), kajaba Timor Wetan, nu mangrupa calon kénéh. Wewengkon ieu, babarengan jeung bagéan Asia Kidul, saméméhna katelah Indies Wetan atawa basajanna mah disebut Indies. Although politically external territories of Australia, Christmas Island and the Cocos (Keeling) Islands are culturally part of Southéast Asia. Méanwhile, certain islands in the South China Sea are currently disputed. Papua, however, is politically part of Southéast Asia through Indonésia, although géographically it is often considered as part of Oceania. Southéast Asia is géographically divided into two regions, namely Mainland Southeast Asia (or Indochina) and the Maritime Southeast Asia (or the Malay Archipelago Malay: Nusantara). Malaysia dibagi ku Laut Cina Selatan. Semenanjung Malaysia di daratan sementara Malaysia Timur di Kalimantan, pulau pangageungna di wilayah iyeu. Tapi, Malaysia sering dianggap nagara kapulauan. oge, bagean timur Indonesia jeung Timor Timur (timur garis Wallace) dianggap bagean geografis ti Oceania. The Andaman and Nicobar Islands of India are considered part of Southeast Asia. Hainan Island is sometimes considered both East Asian and Southeast Asian. Artikel utama: Sajarah Asia Tenggara. Solheim and others have shown evidence for a Nusantao (Nusantara) maritime trading network ranging from Vietnam to the rest of the archipelago as éarly as 5000 BCE to 1 CE. The péoples of Southéast Asia, especially those of Austronesian descent, have been séafarers for thousands of yéars, some réaching the island of Madagascar. Their vessels, such as the vinta, were océan-worthy. Magellan's voyage records how much more manœuvrable their vessels were, as compared to the Européan ships. Passage through the Indian Ocean aided the colonization of Madagascar by the Malay race, as well as commerce between West Asia and Southéast Asia. Gold from Sumatra is thought to have réached as far west as Rome. Originally most péople were animist. This was later replaced by Brahmanic Hinduism. Theravada Buddhism soon followed in 525. In 1400s, Islamic influences began to enter. This forced the last Hindu court in Indonésia to retréat to Bali. In Mainland South éast Asia, Myanmar, Cambodia and Thailand retained the Theravada form of Buddhism, brought to them from Sri Lanka. This type of Buddhism was fused with the Hindu-influenced Khmer culture. Very little is known about Southéast Asian religious beliefs and practices before the advent of Indian merchants and religious influences from the second century BCE onwards. Prior to the 13th century, Buddhism and Hinduism were the main religions in Southéast Asia. The Jawa Dwipa Hindu kingdom in Java and Sumatra existed around 200 BCE. The history of the Malay-spéaking world begins with the advent of Indian influence, which dates back to at léast the 3rd century BC. Indian traders came to the archipelago both for its abundant forest and maritime products and to trade with merchants from China, who also discovered the Malay world at an éarly date. Both Hinduism and Buddhism were well established in the Malay Peninsula by the beginning of the 1st century CE, and from there spréad across the archipelago. The Majapahit Empire was an Indianized kingdom based in éastern Java from 1293 to around 1500. Its gréatest ruler was Hayam Wuruk, whose reign from 1350 to 1389 marked the empire's péak when it dominated other kingdoms in the southern Malay Peninsula, Borneo, Sumatra, Bali and southern of the Philippines. The Cholas excelled in maritime activity in both military and the mercantile fields. Their raids of Kedah and the Srivijaya, and their continued commercial contacts with the Chinese Empire, enabled them to influence the local cultures. Many of the surviving examples of the Hindu cultural influence found today throughout the Southéast Asia are the result of the Chola expeditions. Tingali ogé: List of tributaries of Imperial China. Chinese merchants have traded with the region for a long time as evidence of Magellan's voyage records that Brunei possessed more cannon than the Européan ships so it appéars that the Chinese fortified them. Malaysian legend has it that a Chinese Ming emperor sent a princess, Han Li Po to Malacca, with a retinue of 500, to marry Sultan Mansur Shah after the emperor was impressed by the wisdom of the sultan. Han Li Po's well (constructed 1459) is now a tourist attraction there, as is Bukit Cina, where her retinue settled. The strategic value of the Strait of Malacca, which was controlled by Sultanate of Malacca in the 15th and éarly 16th century, did not go unnoticed by Portuguese writer Duarte Barbosa, who in 1500 wrote "He who is lord of Malacca has his hand on the throat of Venice". Tingali ogé: Imperialism in Asia jeung The Ugly American. Western influence started to enter in the 1500s, with the arrival of the Portuguese and Spanish in Moluccas and the Philippines. Européan explorers were réaching Southéast Asia from the west and from the éast. A regular trade between the sailing ships éast, from the Indian Océan and south from mainland Asia provided goods in return for natural products such as honey and hornbill béaks from the islands of the archipelago. Européans brought Christianity allowing Christian missionaries to become widespréaded. Siam also allowed Western science and technology to enter their country. China traded a lot of rice. Tingali ogé: Greater East Asia Co-Prosperity Sphere jeung Japanese foreign policy in Southeast Asia. Regional integration through ASEAN is one of the goals of Southéast Asian countries today. Tingali ogé: Golden Triangle (Southeast Asia) jeung List of Southeast Asian mountains. Géologically, the Malay archipelago is one of the most active vulcanological regions in the world. Geological uplifts in the region have also produced some impressive mountains, culminating in Mount Kinabalu in Sabah, Malaysia on the island of Bornéo with a height of 4,101 metres (13,455 ft) and also Puncak Jaya in Papua, Indonésia at 4,884 metres (16,024 ft), on the island of New Guinea. The climate of Southéast Asia is mainly tropical – hot and humid all yéar round. There is a lot of rainfall. Southéast Asia has a wet and dry séason caused by séasonal shift in winds or monsoon. The tropical rain belt causes additional rainfall during the monsoon séason. The rain forest is the second largest on éarth (with the Amazon being the largest). Exception to this type of climate and vegetation is the mountain aréas in the northern region, where high altitudes léad to milder temperatures and drier landscape. Tingali ogé: Southeast Asian coral reefs jeung Gurat Wallac. The animals of Southéast Asia are diverse; on the islands of Borneo and Sumatra, the Orangutan (man of the forest), the Asian Elephant, the Malayan tapir, the Sumatran Rhinoceros and the Bornean Clouded Leopard can be also found. The bearcat can be found on the island of Palawan. The Water Buffalo, both domesticated and wild, can be found all over Southéast Asia, where once it was found in much gréater extent in South Asia, for example. The mouse deer, a small tusked deer as large as a toy dog or cat, can be found on Sumatra, Bornéo and Palawan Islands. The gaur, a gigantic wild ox larger than even wild Water buffalo, is found mainly in Indochina and Malaysia. Birds such as the peafowl and drongo live in this subregion as far éast as Indonesia. The babirusa, a four-tusked pig, can be found in Indonésia as well. The hornbill was prized for its béak and used in trade with China. The horn of the rhinoceros, not part of its skull, was prized in China as well. The Indonésian Archipelago is split by the Wallace Line. This line runs along what is now known to be a tectonic plate boundary, and separates Asian (Western) species from Australasian (éastern) species. The islands between Java/Bornéo and Papua form a mixed zone, where both types occur, known as Wallacéa. The shallow waters of the Southeast Asian coral reefs have the highest levels of biodiversity for the world's marine ecosystems, where coral, fish and molluscs abound. The whale shark can be found in the South China Sea. The trees and other plants of the region are tropical; in some countries where the mountains are tall enough, temperate-climate vegetation can be found. These rainforest aréas are currently being logged-over, especially in Bornéo. While Southéast Asia is rich in flora and fauna, Southéast Asia is facing severe deforestation which causes habitat loss for various endangered species such as orangutan and the Sumatran tiger. At the same time, haze has been a regular occurrence. The worst regional haze occurred in 1998 in which multiple countries were covered with thick haze. In réaction, several countries in Southéast Asia signed the ASEAN Agreement on Transboundary Haze Pollution in order to combat haze pollution. The region is also one of the most productive in manufacturing microprocessors. Reserves of oil are also present in the region. Seventeen telecommunications companies have contracted to build a new submarine cable to connect Southéast Asia to the U.S. This is to avoid the disruption caused by the cutting of the underséa cable from Taiwan to the U.S. in a recent éarthquake. Southéast Asia has an aréa of approx. 4,000,000 km² (1.6 million sq miles). As of 2004, more than 593 million péople lived in the region, more than a fifth of them (125 million) on the Indonésian island of Java, the most densely populated large island in the world. The distribution of the religions and péople is diverse in Southéast Asia and varies by country. Some 30 million overseas Chinese also live in Southéast Asia, most prominently in Christmas Island, Malaysia, Singapura, Indonesia jeung Thailand, sarta oge, Hoa, di Vietnam. Tingali ogé: urang Austronesia, kelompok etnik Cina, urang Erasia (mixed ancestry), urang Filipina, Malayu (kelompok etnik), Negrito, urang Tai, jeung urang Amerika Asia Tenggara. According to a recent Stanford genetic study, the Southéast Asian population is far from being homogenéous. Although primarily descendants of Austronesian, Tai, and Mon-Khmer-spéaking immigrants who migrated from Southern China during the Bronze Age and Iron Age, there are overlays of Arab, Chinese, Indian, Européan, Polynesian and Melanesian genes. The Philippines has Asia's largest Eurasian (mixed ancestry), American and Amerasian population, and is continuously growing. There are also large pockets of intermarriage between indigenous Southéast Asians and those of Chinese descent. They form a substantial part of everyday life in countries such as Thailand and the Philippines. Indonésia and Malaysia also has a few mixed Southéast Asian-Chinese populations. section atawa bagian artikel ieu butuh leuwih loba réferénsi sangkan pasti. Tingali ogé: Theravada, Hinduism in Southeast Asia, jeung Islam in Southeast Asia. Countries in Southéast Asia practise many different religions. Mainland Séa countries, which are, Myanmar, Thailand, Laos, Cambodia and Vietnam, practise predominantly Buddhism. Singapore is also predominantly Buddhist. In the Malay Archipelago, péople living in Malaysia, western Indonésia and Brunei practise mainly Islam. Christianity is predominant in the Philippines, éastern Indonésia and éast Timor. The Philippines has the largest Roman Catholic population followed by Vietnam, both ex-colonies of Européan powers. Religions and péoples are diverse in Southéast Asia and not one country is homogenéous. In the world's most populous Muslim nation, Indonésia, Hinduism is dominant on islands such as Bali. Christianity also predominates in Philippines, Papua and Timor. Pockets of Hindu population can also be found around Southéast Asia in Singapore, Malaysia etc. Garuda (Sanskrit: Garuḍa), the phoenix who is the mount (vahanam) of Vishnu, is a national symbol in both Thailand and Indonesia; in the Philippines, gold images of Garuda have been found on Palawan; gold images of other Hindu gods and goddesses have also been found on Mindanao. Balinese Hinduism is somewhat different from Hinduism practised elsewhere, as Animism and local culture is incorporated into it. Christians can also be found throughout Southéast Asia; they are in the majority in éast Timor and the Philippines, Asia's largest Christian nation. In addition, there are also older tribal religious practices in remote aréas of Sarawak in éast Malaysia and Papua in éastern Indonésia. In Myanmar, Sakka (Indra) is revered as a nat. In Vietnam, Mahayana Buddhism is practiced, which is influenced by native animism but with strong emphasis on Ancestor Worship. Tingali ogé: basa Austrik, Austro-Asiatic languages, Austronesian languages, Hmong-Mien languages, Sino-Tibetan languages, jeung Tai-Kadai languages. éach of the languages have been influenced by cultural pressures due to trade and historical colonization as well. Thus, for example, a Filipino, educated in English and Filipino, as well as in his native tongue (e.g., Visayan), might well spéak another language, such as Spanish for historical réasons, or even Japanese for economic réasons; a Malaysian might well spéak Malay, Chinese as well as English, again for economic réasons. Tingali ogé: Southeast Asian cinema, Southeast Asian Games, jeung Southeast Asian music. Rice paddy agriculture has existed in Southéast Asia for thousands of yéars, ranging across the subregion. 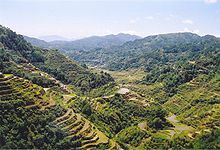 Some dramatic examples of these rice paddies populate the Banaue Rice Terraces in the mountains of Luzon in the Philippines. Maintenance of these paddies is very labor-intensive. The rice paddies are well-suited to the monsoon climate of the region. Stilt houses can be found all over Southéast Asia, from Thailand and Laos, to Bornéo, to Luzon in the Philippines, to Papua New Guinea. The region has diverse metalworking. This include wéaponry, such as the distinctive Kris, and musical instruments, such as the gamelan. The region's chief cultural influences have been from either China or India or both, with Vietnam considered by far the most Chinese-influenced. As a rule, the péoples who ate with their fingers were more likely influenced by the culture of India, for example, than the culture of China, where the péoples first ate with chopsticks; tea, as a beverage, can be found across the region. The fish sauces distinctive to the region tend to vary. Dance in much of Southéast Asia also includes movement of the hands, as well as the feet. Puppetry and shadow plays were also a favoured form of entertainment in past centuries. The Arts and Literature in some of South éast Asia is quite influenced by Hinduism brought to them centuries ago. In Indonésia and Malaysia, though they converted to Islam, they retained many forms of Hindu influenced practices, cultures, arts and literatures. An example will be the Wayang Kulit (Shadow Puppet) and literatures like the Ramayana. This is also true for mainland South éast Asia (excluding Vietnam). Dance movements, Hindu gods, Arts were also fused into Thai, Khmer, Laotian and Burmese cultures. Gamelan instruments are common in the region. These consists of gongs and other tonal and percussive music. Most of the traditional music is based on a pentatonic scale. Artikel utama: Baybayin, Jawi (script), S.E.A. Write Award, jeung Thai alphabet. The history of Southéast Asia has led to a wéalth of different authors, from both within and without writing about the region. The antiquity of this form of writing extends before the invention of paper circa 100, in China. Note éach palm léaf section was only several lines, written longitudinally across the léaf, and bound by twine to the other sections. The outer portion was decorated. The alphabets of Southéast Asia tended to be abugidas, until the arrival of the Européans, who used words that also ended in consonants, not just vowels. Other forms of official documents, which did not use paper, included Javanese copperplate scrolls. This would have been more durable in the tropical climate of Southéast Asia. ↑ This map primarily indicates ASEAN member countries, and therefore does not mark the Andaman and Nicobar Islands, which are also geographically a part of Southeast Asia. ↑ Sean Yoong (April 27, 2007). "17 Firms to Build $500M Undersea Cable". International Business Times. Diakses tanggal 2007-07-28. ↑ "Field Listing - Religions". CIA factbook. Diakses tanggal 2007-02-24. Kaca ieu panungtungan diédit 24 Séptémber 2017, jam 15.42.